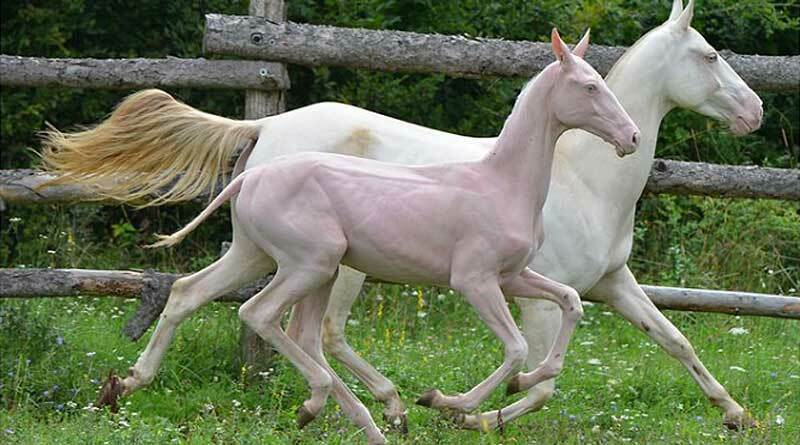 Researchers have identified the gene variation that is most likely responsible for an unusual syndrome in the Akhal-Teke horse breed from Turkmenistan, in which foals are born with almost no hair and scaly skin. In doing so, they have provided what they believe is the first description in scientific literature of the condition known as Naked Foal Syndrome. Affected horses die between a few weeks and three years of age. It is not clear whether a specific disease process causes their premature deaths. The syndrome is inherited as a monogenic autosomal recessive trait. The first records of hairless Akhal-Teke foals date back to 1938. Since then the number of such foals has increased steadily. Many horses with the syndrome might have been registered as stillborn or weak born, the authors suggested, or not been reported at all. The findings of the international team of researchers based their findings on analysis of the genome sequencing of two affected horses, two carriers, and 75 control horses from other breeds. They successfully mapped the disease-causing genetic variant to two segments on chromosomes 7 and 27 in the equine genome. They found that a single nonsynonymous genetic variant on the chromosome 7 segment was perfectly associated with the syndrome, affecting the ST14 gene. Horses with the syndrome inherit this nonsense variant, which they named ST14:c.388G>T, from each of their parents. The study team noted that genetic changes in the ST14 gene in humans were known to be behind inherited skin scaliness. The researchers, writing in the journal G3: Genes, Genomics Genetics, said their findings would enable genetic testing to avoid the non-intentional breeding of foals with the condition. The study team also described two cases. The first involved a male cremello foal born in March 2014, which was still alive at the time of the paper’s revision in January this year, when it was aged 2 years and 10 months. Compared to non-affected horses of the same age, and raised at the same stud, it had a growth delay and was small for its age. The horse had only sparse and thin body hairs. The upper portion of all limbs were completely bald, with hair density increasing toward lower extremities. The mane and hairs at the tail were sparse or absent. Whiskers were present but sparse, curly, and abnormally short. Eyelashes were missing. Its skin was dry and scaly in some areas. A persisting increase in tear flow was reported by the owner. Scars and erosive lesions were present, possibly due to the missing physical protection of a normal hair coat. The researchers did not observe any abnormalities in the teeth or hooves. The second case was a female born in June 2016. Its skin and hair pattern closely resembled that of the first case. Its hooves and teeth were also normal. This foal was euthanised at 21 days of age due to a spontaneous leg fracture. A full necropsy was performed. Gross findings revealed a mild internal hydrocephalus (an accumulation of cerebrospinal fluid within the brain), a heart defect, and severely altered lymphoid organs. Microscopic investigation of the lymphoid organs were consistent with a defect in primary immune organ development, and the specific immune response. Problems were seen in the thymus, the spleen and peripheral lymph nodes. Discussing their findings, the study team said the ST14 gene had essential roles in skin and hair follicle development, with mutations causing related conditions in humans and mice. However, affected horses developed more severe baldness than in human patients, with less skin scaliness. “It is not fully clear why Naked Foal Syndrome-affected foals have such a short life expectancy,” they said. “While none of the known [affected] foals so far became older than three years, there also was huge variability, with some foals dying at a few weeks of age, and others surviving at least for more than two years. Further research will be necessary to characterize the causes leading to premature death in these horses, they said. The study team comprised Anina Bauer, Theresa Hiemesch, Vidhya Jagannathan, Markus Neuditschko, Iris Bachmann, Stefan Rieder, Sofia Mikko, Cecilia Penedo, Nadja Tarasova, Martina Vitková, Nicolò Sirtori, Paola Roccabianca, Tosso Leeb and Monika Welle. They are variously affiliated with the University of Bern in Switzerland; the Swedish University of Agricultural Sciences; the University of California, Davis; the University of Milan in Italy; the Russian Akhal-Teke Association; Russia International Akhal-Teke Association; and several veterinary practices. Akhal-Teke horses are a national emblem of Turkmenistan, where they enjoy a reputation for speed, endurance, intelligence, and a distinctive metallic sheen to their coat. Anina Bauer, Theresa Hiemesch, Vidhya Jagannathan, Markus Neuditschko, Iris Bachmann, Stefan Rieder, Sofia Mikko, M. Cecilia Penedo, Nadja Tarasova, Martina Vitková, Nicolò Sirtori, Paola Roccabianca, Tosso Leeb and Monika M. Welle. Get him/her a sunscreen blanket and visor. SUNBURN!! Hi Rhona , Is your mare an Appaloosa or spotted ? The thin mane and tail hair is a charicturistic of the spotted pattern . I am just starting to work with horses but I have had much success growing hair on dogs. I work with a veterinarian who is very well versed in skin care. Please reach out to him. Dr.Cliff Favor.